Polystorm ... being installed at Jebel Ali Hills project. The region needs to draw up a plan to conserve water through harnessing its stormwater run-off, says ROBIN APPLEBY*, adding that Polypipe’s innovative approach provides a solution. least water-secure region in the world, rapid urbanisation and growing populations will continue to place increasing demands on our limited water sources over the next two decades, leading to severe water stress across the Gulf by 2040, according to the World Resource Institute. Conversely, although one of the world’s driest regions, the impact of climate change is shifting the weather patterns in the Middle East. Yet, without suitable infrastructure master planning, our cities will be ill prepared for stormwater and suffer from hazardous flood events as a result. These conflicting factors leave the region vulnerable to the damaging effects of either too much or too little water. With exceptional water-related challenges in the foreseeable future, the region’s leaders are taking action to safeguard our next generations by encouraging more efficient use of this valuable commodity. The UAE’s Vice President and Prime Minister and Ruler of Dubai, His Highness Sheikh Mohammed bin Rashid Al Maktoum, for instance, is proudly leading the UAE Centennial 2071 project, which recognises the value of managing resources to provide a happy and thriving environment for generations to come. It is this crucial demand for building resilience that has prompted a major shift in the perception of sustainable water management, most notably sustainable urban drainage systems (SuDS). In order to reduce the region’s reliance on desalination and its environmental effects, planners are beginning to recognise the necessity to harvest and utilise all of our accessible water sources. With the future of the Middle East resting on the availability of this resource, it comes as no surprise that managing this precious commodity needs a forward-thinking, integrated approach. 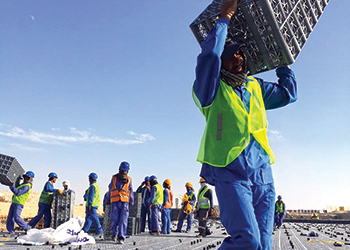 To address the challenges posed by the Middle East’s mass urbanisation, Polypipe has taken a step back to learn from the most successful living system in the world – nature. Taking inspiration from the ecosystem’s cyclic method of water management, the drainage expert adopted a nature-based approach for its pioneering range of storm and waste-water solutions to help accelerate the region’s transition towards a more sustainable future. Once deemed a liability for its risk of flooding, stormwater run-off caused by heavy rainfall on large impervious surfaces is now recognised as a valuable asset within a SuDS approach. Polypipe’s Polystorm and Permavoid water management solutions have been developed to capture, control and reuse stormwater more efficiently within the built environment. In fact, its unrivalled selection of nature-based solution, including zero-energy geocellular tanks and capillary irrigation systems, provides a one-stop approach to surface water retention and treatment, attenuation, infiltration, soakaway and flow control to utilise water as ‘on-demand’ natural irrigation. Polypipe SuDS-compliant solutions ... have been installed on a number of projects in the UAE. 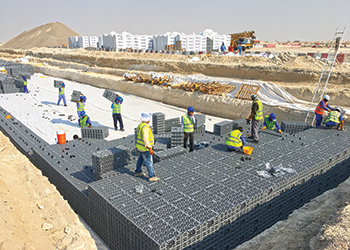 Polystorm is a water management solution manufactured for the region by Polypipe in the UAE to provide SuDS-compliant surface water retention, attenuation and/or infiltration following stormwater events. Suited for deeper applications, the system’s 95 per cent void ratio significantly reduces the footprint of the installations. The modular cells are wrapped in permeable geotextile to provide maximum water capture and subsequent infiltration into groundwater systems. Using the natural infiltration properties of subsoil, the geocellular system can assist with replenishment of groundwater at a controlled rate and volume that won’t saturate or flood surrounding land, minimising environmental impact. 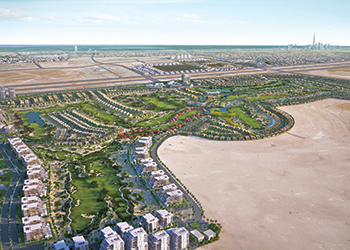 Polypipe has worked closely with international infrastructure consultants to design and determine a suitable stormwater management system for Jebel Ali Hills, a major residential project in Dubai, UAE. Given the lack of local drainage networks in the area, the required solution needed to minimise the potential impact of rainfall events to ensure the project’s resilience. Polystorm geocellular solutions were specified for this development due to their third-party accredited structural capability in a challenging environment, where long-term performance and durability were crucial. The ability to manage water in the built environment with SuDS allows landscape architects and engineers to design much more experimental and multifunctional urban and green spaces. However, structures at greater depths can sometimes present challenges for construction. Permavoid, a shallower geocellular water conservation system aimed at managing surface water at source, helps to make space for water in areas where such projects are challenging. Not only do Permavoid’s modular cells and patented geotextile enable designers to include a valuable source control and treatment system, they also combine capillary irrigation technology that reuses waste water to sustainably support vegetation in surrounding soft landscapes and green areas. This passive form of irrigation is 100 per cent ‘on demand’ and activates only when the plants are evaporating water, eliminating the need for expensive pumping systems and providing 24-hour irrigation with no energy requirements. These intelligently engineered, sustainable water management solutions are also manufactured from environment-friendly, virgin raw materials. Lighter in weight than traditional legacy materials, the plastic geocellular systems reduce energy in production, transport and use without impacting the project’s overall durability. In fact, with structurally robust individual cells, Polystorm and Permavoid are proven solutions tested to perform within the Middle Eastern environment. The region’s most precious resource requires managing much more efficiently if we are to create a sustainable urban environment. Through innovative and sustainable nature-based solutions, such as Polystorm and Permavoid, the Middle East can build up resilience to resource scarcity and secure a viable future for the next generation. Polypipe is an expert in intelligently engineered drainage, piping and water management systems. Boasting a first-of-its-kind technology, it is leading the field in sustainable water management solutions. 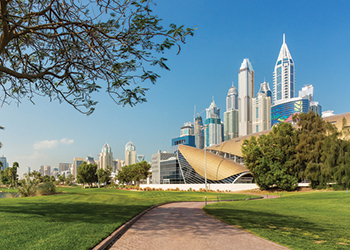 Active in the Middle East for over 50 years and with a manufacturing facility in the UAE since 2016, Polypipe is well-versed in regional practices, requirements and regulations and ideally placed to offer innovative solutions that meet the needs of the local environment and its rapidly growing infrastructure. * Robin Appleby is managing director of Polypipe Middle East and India.